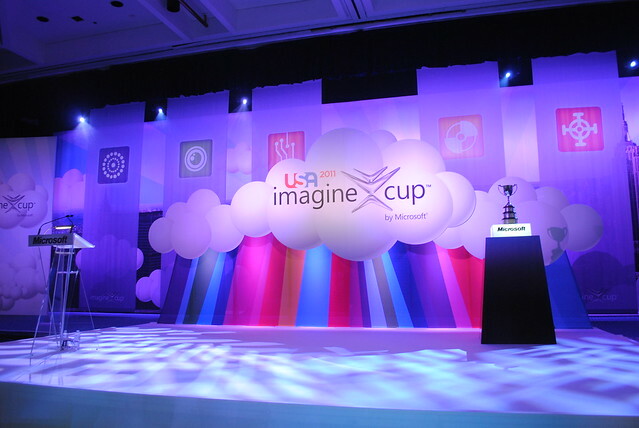 Today at 5:30PM Eastern Time the official ImagineCup opening ceremony took place at the Marriott hotel in Manhattan, New York City. With as much excitement as there was in the air, the room was full. Students from Europe, Asia and Middle East were anxious to see who would open the competition and what is the general plan for the next couple of days. The keynote was started by John Perera, who welcomed the students who reached the finals. He highlighted general team achievements and mentioned that over 13,000 projects were submitted this year. The competition now counts 1.4 million registered students (for the complete ImagineCup cycle) and over 350,000 participants that signed up this year alone. Next on stage was Arthur Vanderveen - the CEO of the Office of Innovation for the New York City Department of Education. He talked about the importance of the projects developed by the teams present at the ceremony and how each one of those is able to contribute to a better world and are more than welcome to implement those in New York City itself. Mr. Vanderveen mentioned that he recently sprained his ankle and that one of the projects of a Romanian team (SIMPLEX) is actually able to help him personally. Steve Ballmer took the stage with his usual energy and enthusiams, that was transferred to the cheering and applauding public. Mr. Ballmer was mostly talking about the importance of innovation in a modern fast-paced environment. He talked about the Microsoft technologies that evolved in the past year, becoming the flagship products in the enterprise and at home - Xbox, Windows Azure, Office365, Lync, Windows (and Skype, among others). He highlighted the evergrowing importance of the cloud in modern infrastructures and how Microsoft is planning to help building the decentralized working environment. The combination of devices + NUI + cloud, in his opinion, is the future of technological progress. Jeffrey D. Sachs - special advisor to the United Nations Secretary General Ban Ki-moon on the Millennium Development Goals, also had an important message to deliver to all attendees. Mr. Sachs emphasized the importance of projects that facilitate the improvement of the natural environment. An important topic in his discourse was disease control and the reduction of famine - two major problems still present in all corners of the world. Educational access was touched as a major problem that is present even in the United States. Dennis Crowley, the founder of Foursquare, was also talking during the keynote, telling the students why each one of them is already a winner, and it doesn't matter what the outcome of the finals will be - they already reached a pretty high point. He talked about Foursquare and how ten years of failure brought him to success. He encouraged students to pursue their ideas and to make sure that they are implemented - even if there are people who don't like them or who will try to bring them down. Hard work and honest effort will actually help in the long run: "everything that didn't work out at my first job, everything that didn't work out at Google or Vindigo or teaching little kids how to snowboard, all that stuff has gone into the formula that makes Foursquare interesting and special." 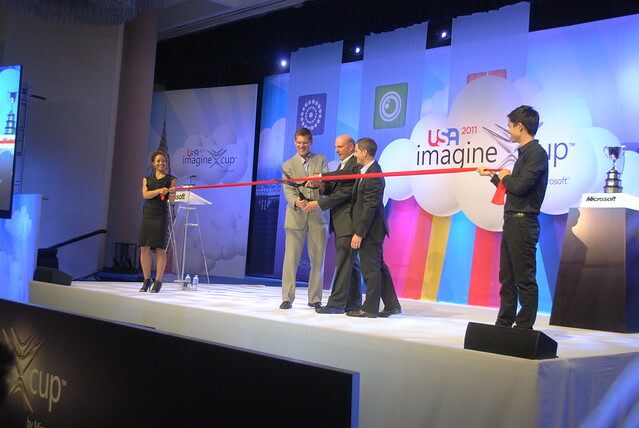 The opening ceremony ended with all three keynote leaders cutting the red tape. For the official transcript of the ceremony, you can visit the Microsoft PressPass page.